Our spring 2004 exhibit, Gestures of Life, highlighted Graham’s legacy through rarely seen images taken by the distinguished photographer Barbara Brooks Morgan (1900-1992). 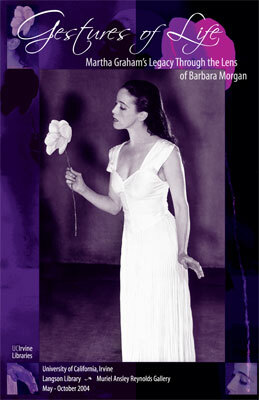 The Morgan photographs that were on exhibit are prime examples of her close artistic collaboration with Graham during the 1930s and 1940s. They provide insight into the photographic techniques that she applied to draw the viewer into the immediacy of the moment of performance and the essence of Graham’s choreography. Additional archival materials in the exhibit illuminated the artistic legacies of both of these remarkable women. Curator Bonnie Oda Homsey is director of the American Repertory Dance Company in Los Angeles and has a Master of Fine Arts degree in dance from UC Irvine. She was a principal dancer with the Martha Graham Company during the 1970s, originating a variety of roles choreographed by Graham. She has taught the Graham Technique for the UCI Dance Department since 1997. Both the exhibit and Homsey’s recent restaging at UCI of Graham’s classic piece Steps in the Street were made possible by a grant from the National College Choreography Initiative.